In the “Manage Privileges” page you can add the privileges to the users. In this section you can provide the permission for managing the social media accounts like create, edit, authorize and delete. Allow edit/delete privilege for own accounts only – If we select this option, only the account owner can edit or delete the account. 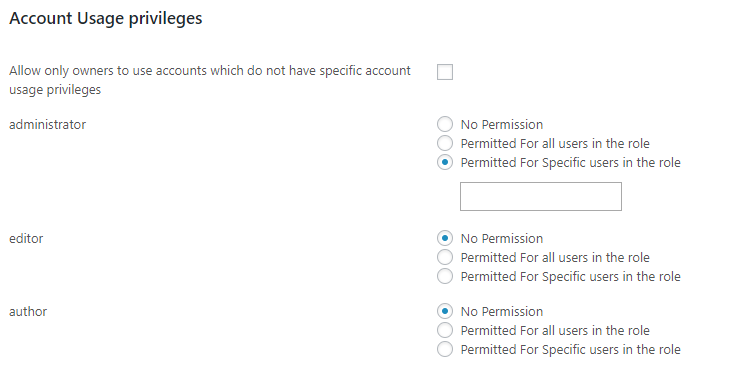 Also we can allow these users to set account usage permissions. Here we can set the permission of usage of accounts when publishing or editing a post/page. Here we can allow only owners to use the account. Here we can set the privileges for the logs management. We can set the privileges for the advanced schedule management. We can set the privileges for the short url management here. We can set the master password for the pages outside the privilege manager here.